How to spin your sticks like Thomas Lang in seven easy steps. We've also put together a treasure trove of tips, tricks and lessons from the stars, featuring advice from Jason Bittner, Ray Luzier, Ian Matthews, Shawn Drover, Stix Zadinia, Gavin Harrison, Chris Pennie and more. What a heap of Drum Icons make of 25 Years of Rhythm. 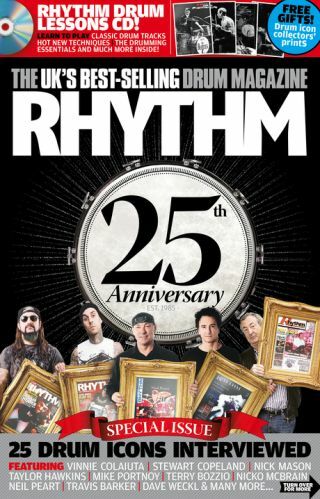 To celebrate a quarter century as the UK's best-selling drumming magazine we've interviewed a host of drum legends, including Neil Peart, Chad Smith, Terry Bozzio, Nicko McBrain, Steve Gadd, Travis Barker, Vinnie Colaiuta, Mike Portnoy and more. We've also re-published classic interviews with Jeff Porcaro and Elvin Jones. How to win more than £10,000's worth of drum gear. To mark our anniversary we've put together a jaw-dropping list of prizes for a huge competition. You can bag a Carrera Drums kit, a set of Sabian cymbals, a DW snare, a signed Carmine Appice cymbal and a whole load more. What Joey Jordison thinks of being named the Greatest Drummer of the Last 25 Years. The Slipknot man gives us his feelings on scooping more than 38,000 votes in our poll. Unsurprisingly, he's pretty pleased. How to play tracks by Mountain, The Cult and Talking Heads on our cover disc. You can also find out how to play like Josh Freese and fusion master Tom Brechtlein and take a guest lesson from Fun Lovin' Criminals sticksman Frank Benbini.